Starwood Rafters was founded in 1964 out of Independence, Wisconsin. Spans from 20' to 72' feet. Can be spaced 8', 10' or 12' feet apart, depending on the load you desire. Combines Glu-Lams, plywood and dimensional lumber for strength and economy. Assembled with exterior-grade adhesives that can hold up better in high-moisture environments than a steel plated truss. Stronger. Can be spaced further apart than conventional truss. More headroom. You gain clearance because the bottom cord is raised. Shop assembled. Comes to the site ready to install. Weather delays are minimized by quick enclosure. Purlin hanger for roof purlins and no open webs on bottom chord eliminates nestling area for birds. The raised bottom chord improves ventilation. I-Lam Beams combine plywood with dimensional lumber nailed and glued for superior strength and dimensional stability. 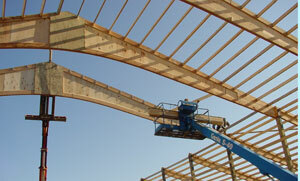 Purlin hanger system between I-Beam rafters speeds erection and provides a more stable building. I-Lam Beams have more load-bearing and spanning capabilities than dimensional lumber. I-Lam Beams can be spaced up to 16' on center depending on span and loadings. Ideal solar applications for livestock enclosures. 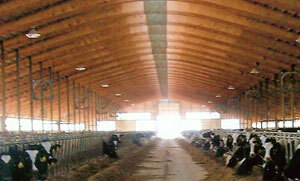 Sunlight and proper ventilation provide a desirable environment for healthier animals. The Lam-Ply Truss results in a stronger structure. Building spans from up to 50'. 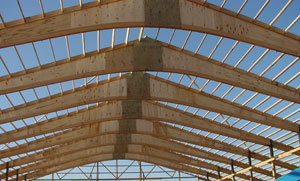 By being able to space trusses up to 12' on center, it speeds erection time and reduces labor costs. Hanger system keep purlins flush with top of truss and no open webbing prevents bird roosting areas. 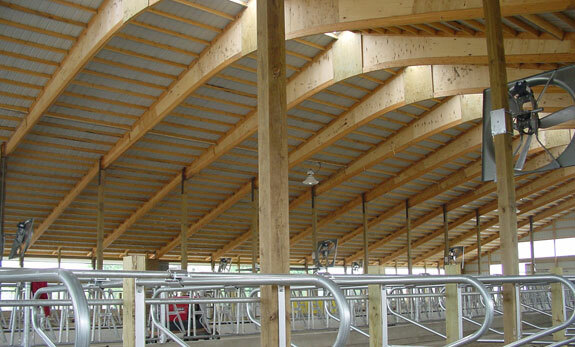 Mono-Solar Lam-Ply Trusses provide buildings that are pleasant to look at inside and out. Solar framing can be built in or we can custom design the truss to fit your needs. Volume of building equal to gothic type building. Design is flexible enough to fit your own design needs. Either use our standard designs or we can custom-build to your design. Must be set on a floor due to withstand the outward thrust of the design. Easy applications of steel roofing. Quick installation of side doors. Building spans up to 60' wide. Rigid frame constructions with a continuous laminated interior core. Lower cost per sq. ft of loading with 12' on center erection. Can be spaced 12' on center depending on the load you desire. 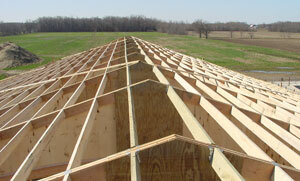 Joist hanger system between gambrel rafters speeds erection and provides a more stable building. Laminated Rafters are strong because of a uniform load distribution over the total length of the rafters. The High Arch Design provides useful floor space and allows the free movement of air to naturally move up and out of the building. The attractive shape of the arch naturally resists wind and snow loads.